1. How do I contact the maltatransfer.com? 2. How do I know if my reservation is confirmed? 3. How do I find my driver? On arrival at Malta International Airport and on leaving the Luggage Reclaim area, follow the maltatransfer.com signs to the maltatransfer.com waiting area or the parking bays where you will find your driver with a vehicle with the maltatransfer.com logo. On departure from your hotel or pick up point the driver will show the maltatransfer.com logo. 4. What happens if I cannot find my driver? Having ensured that you have correctly followed the Airport directions, but still cannot find your driver, contact maltatransfer.com on the contact number supplied on your Transport Voucher. 5. How long will I have to wait at the airport? You will be scheduled to travel with other passengers arriving on flights at a similar time to your own. As soon as all these passengers have arrived you will be transported directly to your destination. If you have booked a Scheduled Shared Transfer, the vehicle will leave at the time stated on your Transport Voucher. If you have been delayed, on arrival please enquire at the maltatransfer.com desk, in the Luggage Reclaim Area, to organise transport on the next available Scheduled Shared Transfer. 6. I have left something in the vehicle. How do I get it back? 7. Do you offer discounted rates for children or babies? Children travel at a reduced rate, infants (2 years and under) travel for free. 8. Can I have a refund if I cancel my booking? Tickets are non refundable. Please read terms and conditions carefully for more details. 9. Can I have a receipt? Your email Transport Voucher is your receipt. 10. How long is the journey to the resort? 11. I have lots of luggage, will there be room? Each passenger has an allowance of one suitcase and one piece of hand luggage. If you are travelling with excess luggage for example pushchairs, wheelchairs, golf clubs, diving equipment or any other out of the ordinary items, it is imperative we are made aware as extra charges are applicable. Failure to do so will result in additional charges incurred by the passengers locally. Please consult the terms and conditions should you have excessive luggage or any other extraordinary items. 12. Is the transfer direct or do we stop en route? Transfers and Scheduled Shared Transfers may be subject to brief stops to collect or drop-off other clients, or as part of the scheduled service. 13. Does the driver speak English? In most cases maltatransfer.com drivers speak English, although scheduling requirements may mean that occasionally a non-English speaking driver may carry out a transfer. 14. Does the transfer vehicle have seat belts? All transfer vechicles are in line with local regulations. 15. What do I do if the driver is late for departure pick-up from the hotel? The pick-up time for your departure is indicated on your ticket. Please allow 20 minutes over this time before contacting us on maltatransfer.com telephone 00356 79646481 or 00356 21332016. 16. Why is my pick-up time so early? The booking procedure will automatically calculate your pick-up time for your flight, as the jouney time plus 2 hours check-in time. All airlines require passengers to be at the airport 2 hours before departure. Maltatransfer.com makes an allowance for traffic conditions, to ensure that you are at the airport on time. 17. What does the price include? A one-way price will include a single journey, either from the airport to your accomodation or from your accomodation to the airport. A return booking includes both the arrival and departure transfer from the airport to accomodation upon arrival and from your accomodation to the airport on departure. The price also includes the carriage of a suitcase and a piece of hand luggage per person. The price is inclusive of VAT. 18. What is your policy on drunken / abusive behavior and smoking? Maltatransfer.com reserves the right to refuse to carry any person who is thought to be under the influence of alcohol or drugs and/or whose behavior is considered to be abusive and could pose a threat to the driver, the vehicle or the other passenger(s). Maltatransfer.com operates a complete non smoking policy in all vehicles used. 19. I am a Gozo resident / tourist departing from Gozo. Where do I find my transport? On arrival at Cirkewwa Terminal you are to go to the maltatransfer.com bus stop in the coach/minibus parking area. Our website will allow you to book your chosen transfer up to 24 hours prior to departure. 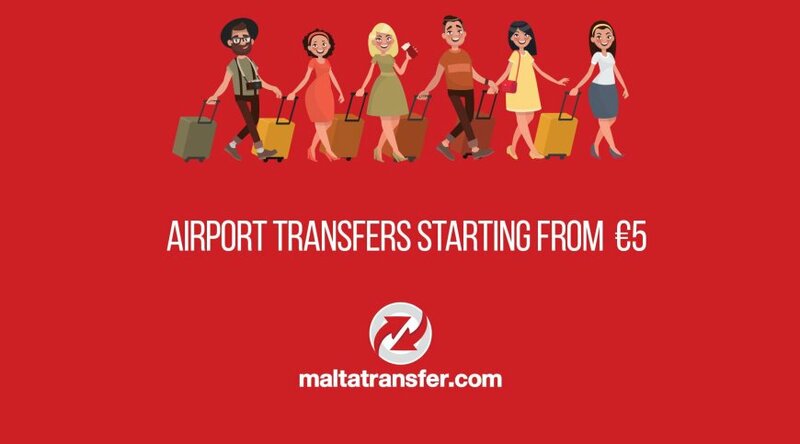 If you require a transfer inside 24 hours, you can book your transfer on arrival in Malta at the maltatransfer.com booking office in the Luggage Reclaim Area. If you are already in Malta and want to book a departure transfer inside 24 hours, you can call maltatransfer.com on tel. No. 00356 21332016.- 00356 79646481 and we will do our best to accomodate your requirements. 21. If I book a transfer through an affiliated hotel''s website, what do I do when I arrive at the airport? You will be using the services of maltatransfer.com. On arrival at Malta International Airport and on leaving the Luggage Reclaim Area, follow the maltatransfer.com signs to our Waiting Area where you will be met by your driver. 22. Is the website secure? When you book through our website, the information of your booking including your credit card details will be automatically directed to the administrative site which is 100% secure. Let our team of professional drivers take you to your end destination. What you see, is what you pay! 24/7 online booking available form everywhere.